What do you associate with Halloween? The first three things I can think of are jack-o’-lanterns, spooky costumes, and loads of Halloween candy. I’m still not sure if I should go Trick or Treat with my kids. The reason why I’m a bit hesitant is that I don’t know where to hide all the candies after that with two toddlers in the house. I really don’t want my twins to have a meltdown when they realise they can’t eat them all. I’ve managed to keep them away from most sugary treats so far, but who knows what would happen when they see their buckets full of Halloween treats. After every Halloween party, I hear people complaining about how many sweets their kids have had. It got me thinking about recipes and what could be a good and healthy Halloween party food that would help to reduce the sugar intake, but still tastes good. Here are some last-minute ideas if you are hosting a Halloween party and want to offer your guests something that is not loaded with sugar. These mini muffins are a great alternative for a party snack that both kids and adults would enjoy. I use only natural sweeteners such as coconut sugar and maple syrup, and to stay true to the Halloween tradition, I add roasted pumpkin to the dough. And of course, I wouldn’t call my brand Nutmad, if I wouldn’t add nuts to this as well. So, here are the ingredients I use for my Halloween mini muffins with pumpkin and walnuts. 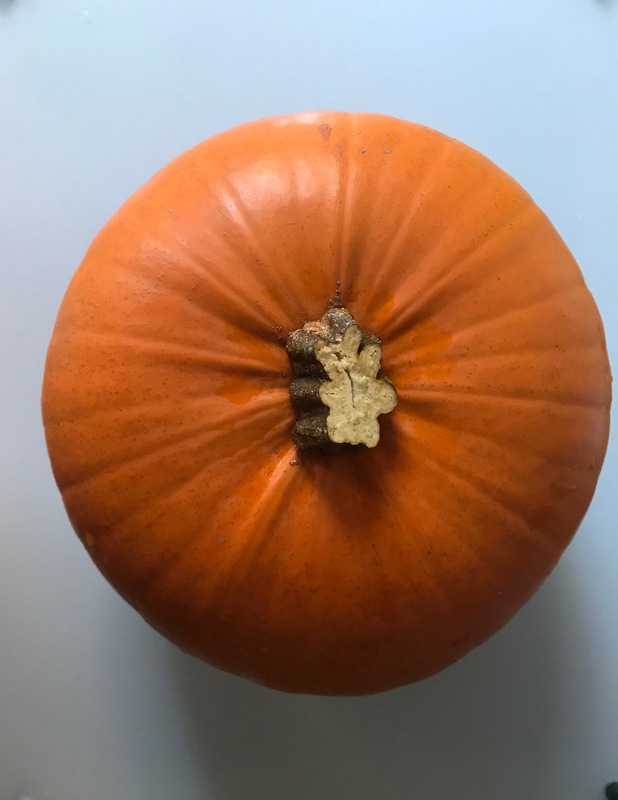 Cut the pumpkin in half, scoop out the seeds and any stringy parts, then cut it in pieces, and roast it for half an hour at 170-180 C, until it’s soft. You can do this earlier and have it ready when you start making the muffins. I suppose you can use a ready-made pumpkin puree if you’re short of time. Let the pumpkin cool down for a bit and peel the skin off. Blend the pieces in a food processor with the walnuts. If you soak the walnuts before that overnight, this would reduce their bitterness and would make your muffins taste nuttier. There’s no need for the walnuts to be dried before you use them for this recipe. 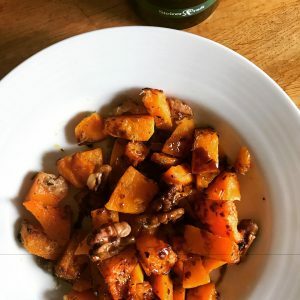 Mix all the other ingredients together and add them to the pumpkin and walnuts mash. 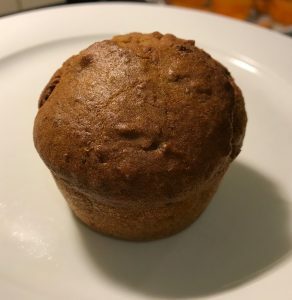 I use cupcake forms but ideally, to make them in a nice party snack shape and size, I recommend using mini muffin forms. Bake at 170 C for about 30-40 minutes, depending on the size of the muffins, and check with a knife if they are ready. If you want to make them a bit “scarier”, finish with some decoration of your choice. Depending on the set up of your party, if you need an idea for a side dish, savoury baked butternut squash is a great idea. Butternut squash is the little sister of the pumpkin; it tastes sweeter, and I think better, on its own. Colour wise it’s going well with the Halloween theme. Peel one squash with a sharp knife (carefully), and dice it. In a bowl mix it with a sprinkle of olive oil, oregano, a little thyme and some grated parmesan cheese. Bake at 170 C until it’s soft and add a handful of activated walnuts for the last 5 minutes. What I like about this recipe is that it’s so versatile. It makes an easy vegetarian meal or a side dish. You can add it to a risotto or mix it with some quinoa as a salad. As nibbles, you could offer some roasted pumpkin seeds. By the way, seeds, as well as nuts, taste very good when they have been activated. Soak them for least seven hours. Then drain them well, place on a tray in the oven for a few hours at max 80 degrees C and bake until they reach the crispiness you like. It’s worth the wait because, like nuts, they really do taste better activated. You can’t really avoid chocolate at a Halloween party, but maybe try to replace it through dark chocolate when possible.